Your annual report is an opportunity to showcase the impact your donors have made on the lives of the people you serve. Your nonprofit annual report should be focused on your donors and tell stories of impact. Many organizations tailor the annual report too much towards bragging about accomplishments instead of demonstrating impact. The annual report is a relationship building tool: if all you do is talk about yourself, that’s not a relationship. Today, I’m going to give you several great examples for inspiration in creating your 2019 nonprofit annual report. A good theme for your nonprofit annual report is to show gratitude to your donors. You can’t thank your donors enough — they are who make it possible for you to do the good work you do. When you’re writing annual report copy, are you demonstrating gratitude? As you review your year, it’s easy to assume donors care about things like a new donation management system, upgraded HVAC at your headquarters, or tweaks to your programmatic model. Very few donors care. They care about the community you built a well in to provide 30 years of clean water. They care about the 300 homeless men you taught job skills to. They care about the 120 dogs you found homes for. They care about the kids you provided after school education to. Donors want to hear about what you’re accomplishing and the lives you’re changing. It’s good to show metrics (such as 200 families provided with shelter and assistance), it’s best when you combine that with real stories of impact. For example, if you’re a homeless shelter, tell a story about a single mom and her kids that you provided shelter and opportunity to improve her life. This is too rare: tell stories of donors whose lives have been changed by giving. Many organizations skip telling donor stories in their annual report, though many donors have their lives changed knowing they are helping real people. Find a donor and tell her story. Why does she give to your organization? What were her expectations? What has she gained by giving? A donor’s story will have an impact on the audience of your annual report: your donors. I’ve scoured the web for the best examples of charity annual reports so you can have guides and examples to inspire you as you design your own nonprofit annual report. These aren’t all examples from 2019, instead, I’ve pulled together some of the best annual reports from a variety of different nonprofits. What I Love: I love how Pencils of Promise shows the impact metrics next to a story of a beneficiary and now staff member of the nonprofit. Stories like these are powerful – when someone moves from being a recipient to becoming staff, you can see the impact the organization had on his life. You’ll also find short donor stories in this well done annual report. The organization uses Issuu for hosting – something common for a lot of nonprofit organizations. What I Love: This isn’t your normal PDF annual report. Each year, Girls Who Code creates an annual report with great animations and special touches to draw your eyes down the page. You’ll love the interactivity, but most of all, you’ll love how clear the organization makes its case for your support. 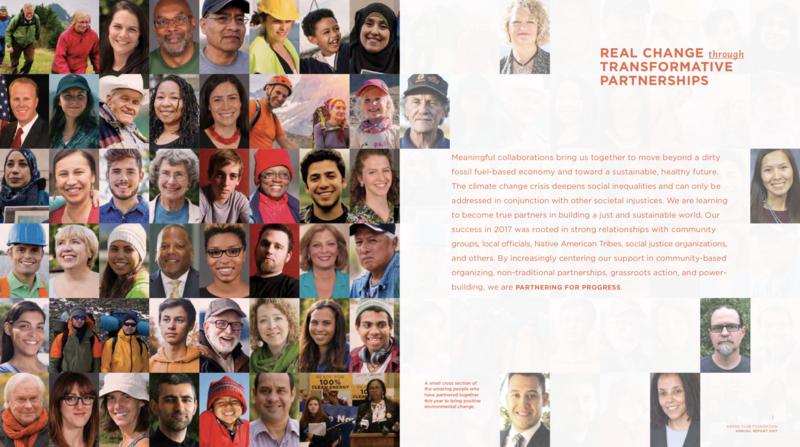 What I Love: Sierra Club Foundation starts with photos of supporters and threads the theme throughout the annual report. They tell stories of what motivates people to support the organization and how the Sierra Club has made a difference. 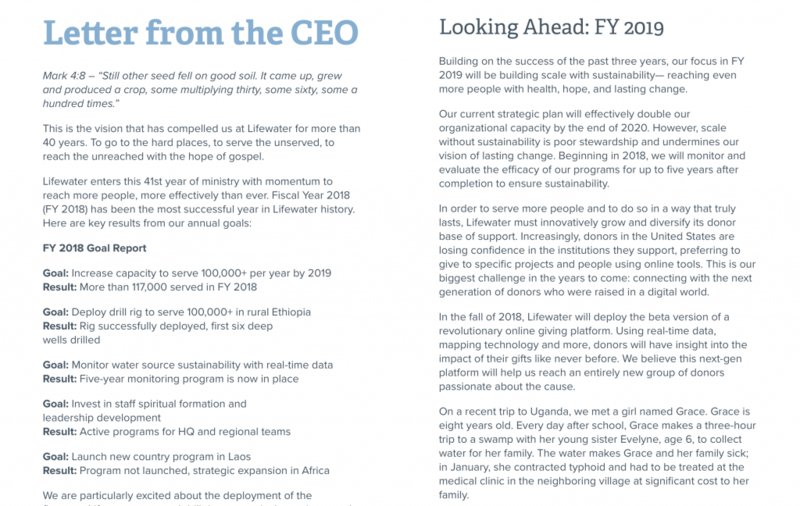 What I Love: In their annual report, Lifewater not only looks back and reviews the previous year, but they also look ahead at what is yet to come. Looking forward at what potential you have over the coming year helps set expectations with your donors. 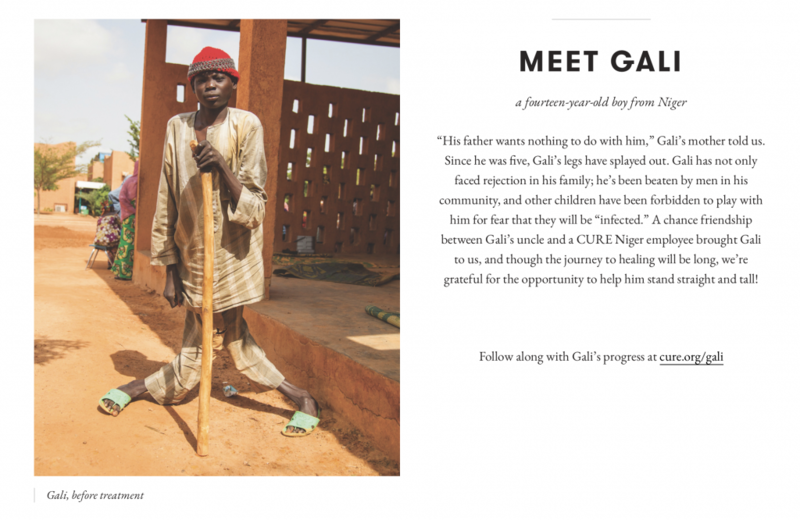 What I Love: The CURE International annual report mixes beneficiary stories throughout. Instead of telling the whole story, the stories link to updates about the child, with an option for the reader to send the child an encouraging note. What a fabulous way to provide engage and connect people directly to the mission of CURE! 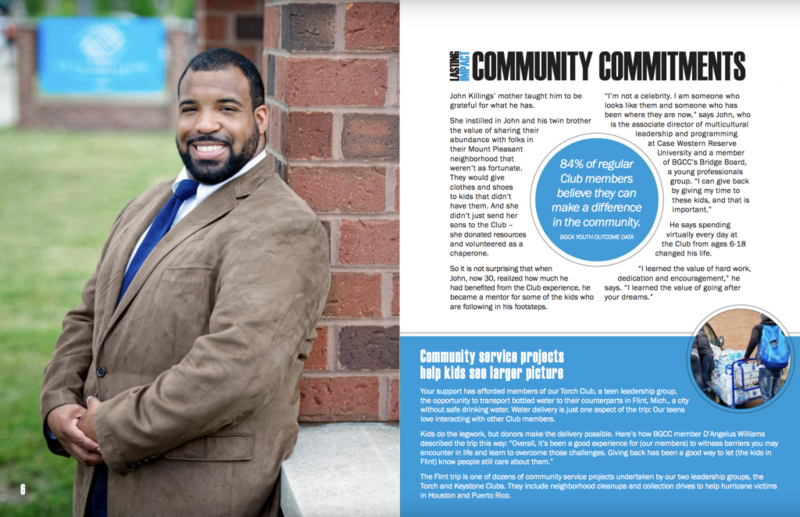 What I Love: In this annual report, Boys and Girls Club of Cleveland includes a number of stories and ties the story back to the program and the “bigger picture” of the good work they do. In this example, John Killings was in a program as a kid and grew up to be a volunteer. Stories of volunteers help reinforce that your nonprofit is trustworthy — people are willing to invest their time into your work. What I Love: The use of quotes from donors are powerful. In this annual report, the Vail Valley Foundation uses donor testimonies throughout to demonstrate why other people support the foundation and their work. Using donors to reinforce the message that your nonprofit is trustworthy is an essential part of development. What I Love: Catholic Charities does so much good in the communities they serve. But because they have a variety of programs, it can be difficult to tell one coherent message. 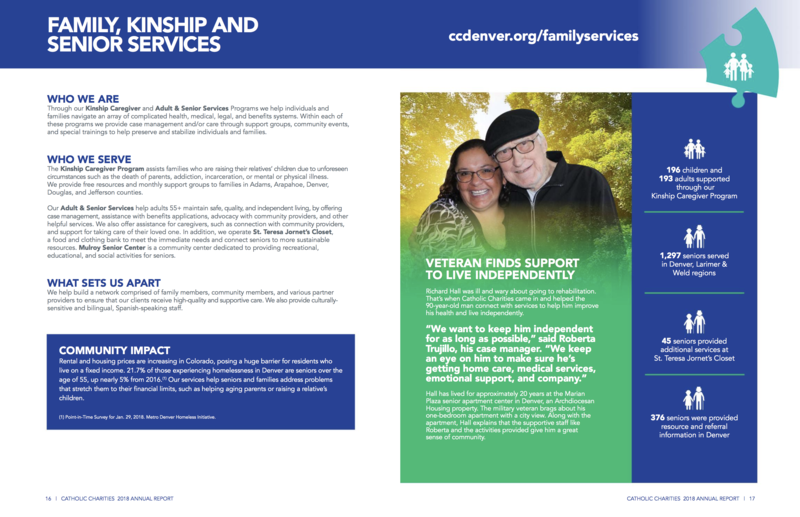 I love how Catholic Charities of Denver weaves the stories of beneficiaries with the number of people served as it walks through each of the programs. When you have a variety of programs and want to feature them, it can muddy the message if you’re not careful. Catholic Charities of Denver does a good job telling a full story for each program.